As we pulled into the port of Trapani, Sicily, I felt an immediate connection to the land. There was an unmistakable sense that long ago, my ancestors called this home. The coast was cluttered with fishing boats and powerful jagged mountains that seemed to rise out of the deep blue sea. Nearing land, I focused my attention and lens on what's known as the "old town" with ancient churches and buildings with texture not typically found in the modern additions. Our ship flew the Italian flag, and I started thinking in their language again. "Ciao, mi chiamo Chris, sono americano, come' stai?" ---Hi, I'm Chris from America, how are you? "Mi dispiace, parlo poco italiano, lentemente per favore." --- Apologies, I only speak a little Italian, please slow down. The climate was hotter, and more arid than both Spain and France, about 82 degrees. 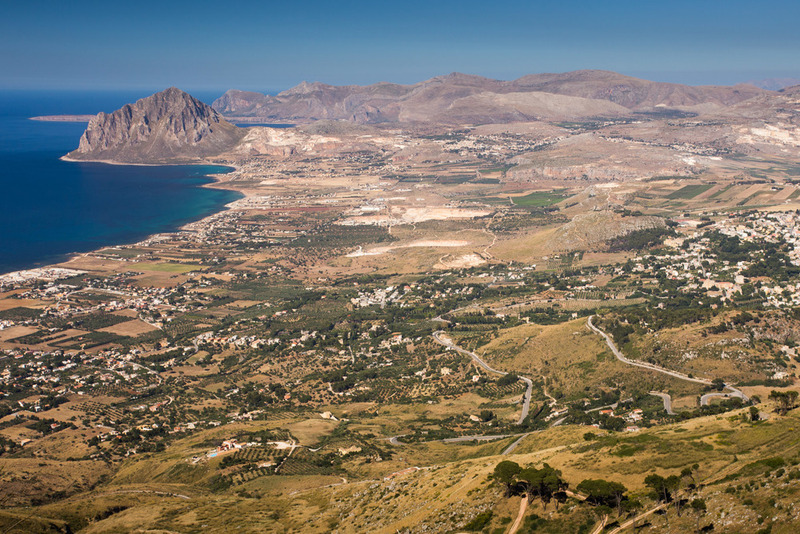 I lathered up in sunscreen before stepping onto Sicilian soil for the very first time. We boarded a bus and had a terrific guide named Enzo who talked about the island of Sicily while we passed through the beautiful countryside with rolling hills, vineyards, and tall mountains. It was a 40 minute drive to the majestic site of Segesta, an unfinished temple which begun in 424 B.C. It's one of the grandest Doric monuments to survive from antiquity. I could not believe my eyes as the temple was absolutely stunning with tall columns all intact and weathered with character. I found a great angle and created a sunburst just above it with a small aperture of f22. I then walked all around it with incredibly close access, making photos from down low, and each side, breathless with awe. 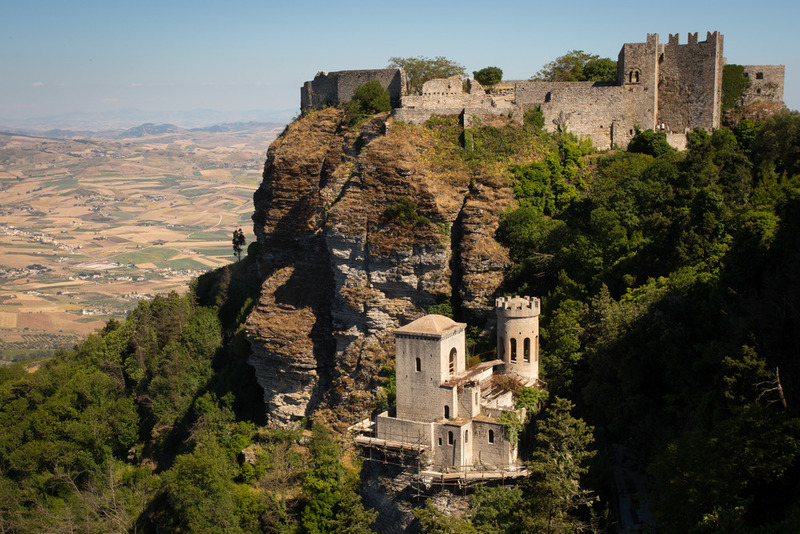 I shook my head with disbelief that I had never heard of this place, and that it existed in Sicily. It was the new highlight for me, and we began the short climb up to the Theatre, carved into the top of Monte Barbaro. This was not an amphitheater as it's not a closed circle like the Roman Colosseum, but rather a semicircle with a splendid mountain view. Everything was original, not a reproduction or modern tourist trap. I made more photos and even photographed myself in front of it with the front-facing camera on the iPhone. There was no way I would leave without picking up a few souvenirs, and I found a couple of inexpensive but nice items to remember the day. We could have gone back to the ship at this point and I would have been satisfied. However, we had a very special journey ahead. Smiling from ear to ear I boarded the bus and we drove towards the mountains of Erice, pronounced Ed-ee-chey. As we traversed a long and winding road, Enzo told us about the various regions of Italy, and how Agrigento has the oldest olives in the country. He told us how they don't eat pasta every day anymore, opting for just three times a week for health reasons. I listened as he went on to talk about how Sicilian wines and coffee are stronger than that of the Northern Italy, such as Milano. Despite our higher altitude, the temperature was still ideal, and I didn't require the sweater I brought along. 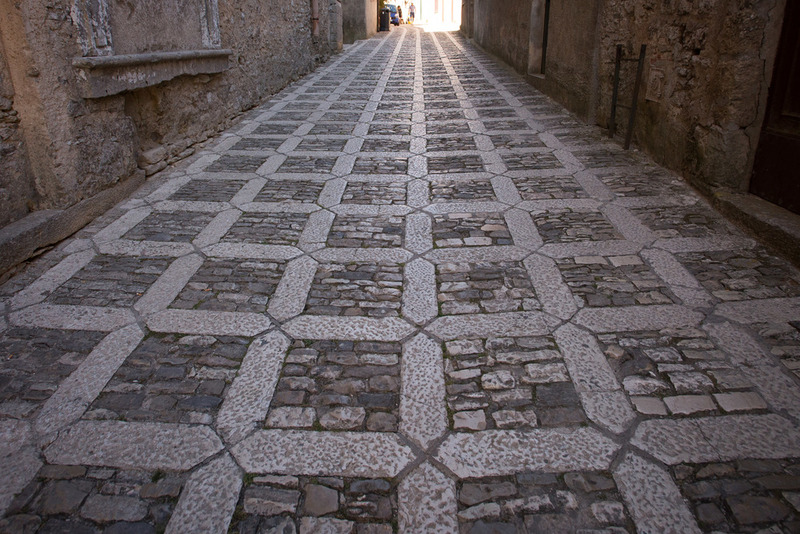 At this point, I purposely went on my own way, opting to explore Erice without the guide. I spoke to a small shop keeper in a ceramic store who in broken English said, "you are Italian, yes". I nodded, and he read my name tag which we wear as part of the cruise group. It may have been the most beautiful I ever heard Corradino pronounced as he rolled the rr's in a way that only a true Italian could. On this cobblestone street I found a few unique handmade items for the house and strolled through these quaint streets until reaching a scenic vista with an expansive view of the mountains, turquoise sea, and an ancient castle. There was an elderly Italian man sitting on a bench and I mistakenly passed by in a rush. I had spent a good deal of time meandering and actually got concerned that I might not have enough time to find my way back. He corrected my rudeness in a polite way by saying "Buongiorno". To show respect I used the more formal "Salve, buongiorno", meaning hello, good day, instead of the informal, Ciao. I proceeded to the edge of the overlook and made several photos before actually jogging back down with camera in hand. Along the way I stumbled upon a few tour members and we walked the rest of the way together. Once again I had seafood for dinner, after all, it was Sicily. I drank a good red wine and enjoyed chocolate mousse cake for desert. Afterwards I went to the library and opened an Art Wolfe photography book. They have an extensive collection of excellent reading material on board. Upon opening the first page I noticed that he personally signed this copy while aboard the ship. I paused for a moment at the possibility that Art Wolfe must have done the same thing that I'm here doing now. Today, he has his very own photography show on PBS. I think that's pretty good company and something to keep working towards! Meanwhile the ship was making great time in fast water as we continued the journey towards the country of Malta.